The Speed Twin will sit at the top of the modern classic range alongside the Scrambler 1200. After a long wait, Triumph has finally taken the wraps off the all-new Speed Twin. This one sits at the top of Triumph’s modern classic range that comprises the Street Twin, Scrambler, Bonneville and the recently revealed Scrambler 1200. 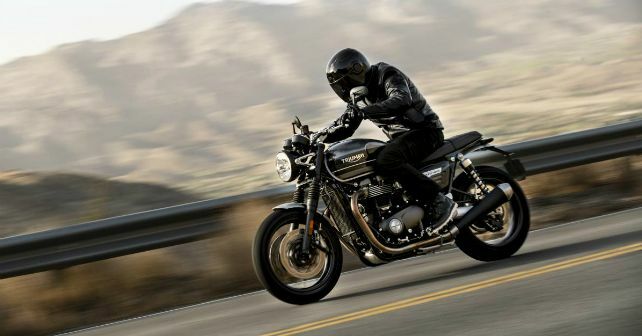 The Speed Twin shares its engine with the Thruxton R and the Bonneville T120 – a 96bhp 112Nm 1,200cc parallel twin motor. This motor comes paired with a 6-speed transmission. Triumph has made some tweaks to the engine, though – a magnesium cam cover and revised clutch and side cases. All the changes help the Speed Twin’s motor shed nearly 2.5 kilos from the Thruxton. Aside from the engine, the Speed Twin also uses a revised iteration of the Thruxton R’s chassis. Up front, it has been fitted with cartridge forks, while at the back it gets preload adjustable twin shocks. Braking duties are performed by twin 305mm discs at the front and a single 220mm disc at the rear. The bike comes standard with dual channel ABS. One of the biggest pluses of the Street Twin was its compact dimensions and the comfortable riding posture. With an 807mm seat height and a reasonable 196 kilos dry weight, the Speed Twin should be fairly easy to ride too. Interestingly, despite the larger motor and a marginally bigger fuel tank, the Speed Twin is lighter than the Street Twin. Unlike the Street Twin, which comes fitted with an 18-inch and 17-inch wheel combination, the Speed gets 17-inch wheels at both ends. Feature-wise, the Speed Twin comes equipped with a semi-digital LCD instrumentation that has a gear position indicator, distance to empty, analogue speedo and tachometer. Some of the other features include heated grips, traction control and tyre pressure monitoring system. Triumph will launch the new Speed Twin in the global market on 18th January. Expect it to make its way to India in the second half of 2019. When launched, expect the Speed Twin to be priced in the Rs 10.5 – 11 lakh range. At that price, it is set to compete against the Harley Davidson Roadster.